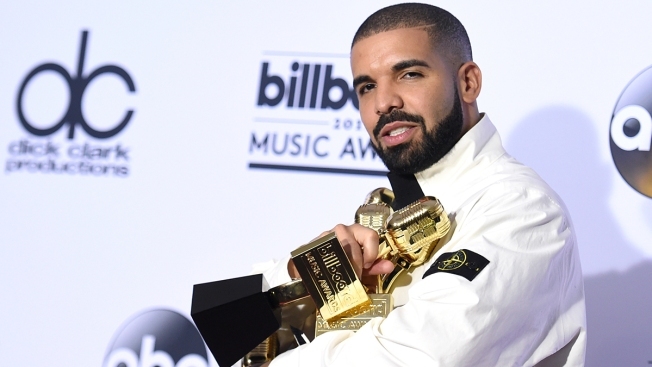 In "Emotionless," Drake raps, "I wasn't hiding my kid from the world, I was hiding the world from my kid"
This May 21, 2017, file photo shows Drake pose in the press room with his 13 awards at the Billboard Music Awards at the T-Mobile Arena in Las Vegas. Drake confirms he's a father on his new album. The 31-year-old rapper from Canada released "Scorpion" on Friday. In two songs on his fifth album, he addresses rumors that he fathered a son with a former French adult-film star. In "Emotionless," Drake raps, "I wasn't hiding my kid from the world, I was hiding the world from my kid." In "March 14," he uses a Michael Jackson reference to say, "She not my lover like Billie Jean, but the kid is mine." The 25-track album features the singles "God's Plan" and "Nice For What." The album follows "More Life" from 2017. "Tonight Show" host Jimmy Fallon and Drake slip mini basketball hoops on their heads and compete in a shootout. Jay Z, Future, Static Major and Ty Dolla $ign are among the artists who appear on the new album. He also samples Nicki Minaj and Mariah Carey.